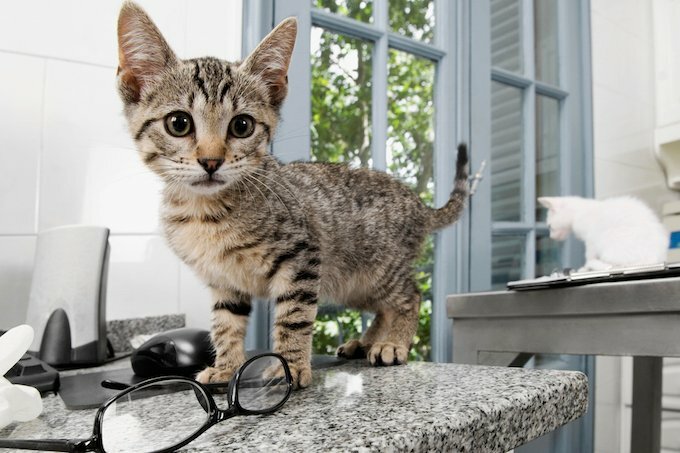 Why You Need To Find Yourself A Vet Who Does Home Visits Now! A few years ago, I was at a traditional bricks and mortar vets for a check up with my cat, Mimosa, when I was told that one of her blood test levels was slightly higher than usual. “What usually causes that?” I asked. “Oh, it’s often stress,” I was told by the technician. “Well, yeah, she’s scared and doesn’t want to be here,” I responded. I then politely turned down a recommendation to get more blood tests to check against that one tiny discrepancy. Happily, those days have become a thing of the past now that I’ve embraced the calm world of home visit vets. It’s safe to say, when it comes to routine yearly wellness exams and minor feline ailments, I won’t be carting Mimosa off to a traditional vets any time soon. I’ve now been using home visit vets for three years. Mimosa’s last yearly exam took place back in August. It was a breeze. There was no hint of her sensing a nervy atmosphere in the air or any grand chase around the apartment in a bid to stuff her into the cat carrier. 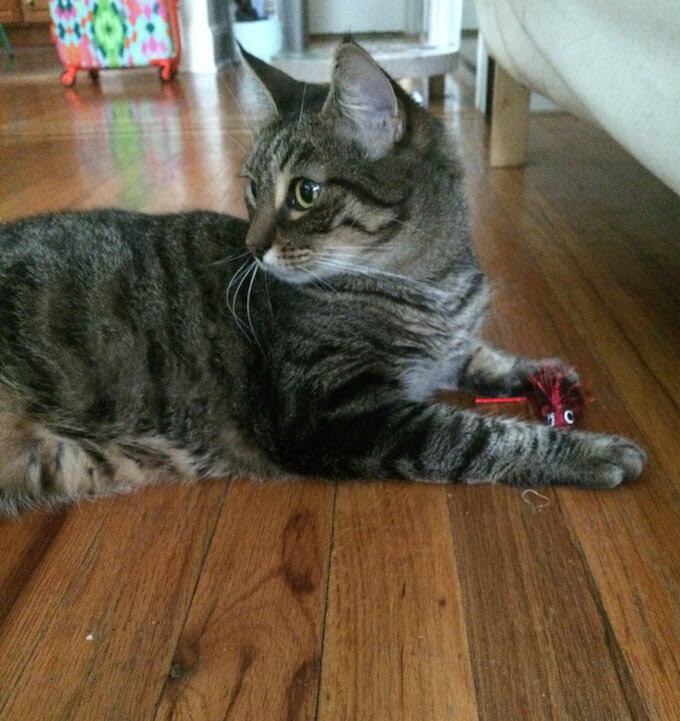 Instead, I was simply told by the vet and his assistant to put Mimosa in a small room before they turned up — mainly so she wouldn’t run and hide under the bed or couch. Trust me, it’s a lot easier to tempt a cat into the bathroom with a couple of treats than trying to entice her to venture through the jaws of a cat carrier. 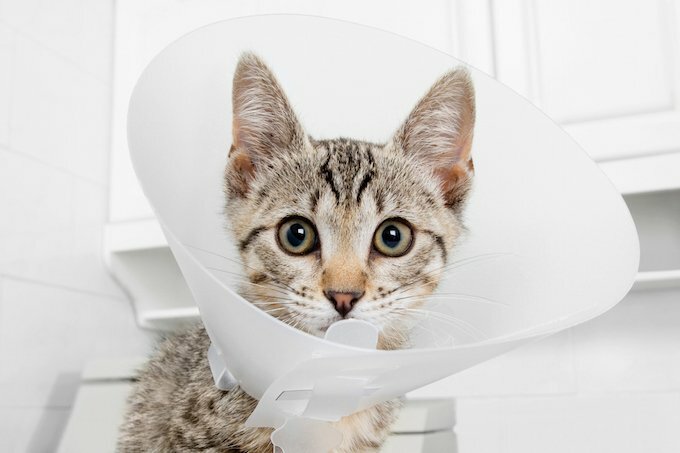 If you’ve ever booked a home vet visit, the formal benefits are readily apparent. It’s less stressful for the cat, and it takes less time out of your own day as you’re not traveling to and from the vets (which, in my case, involves a cab fare both ways). There’s also no chance your cat’s going to inadvertently pick up another illness or ailment from being in an environment packed with other possibly sick (and definitely yapping) animals. In my experience, the format of home vet visits also mean they end up being cheaper. 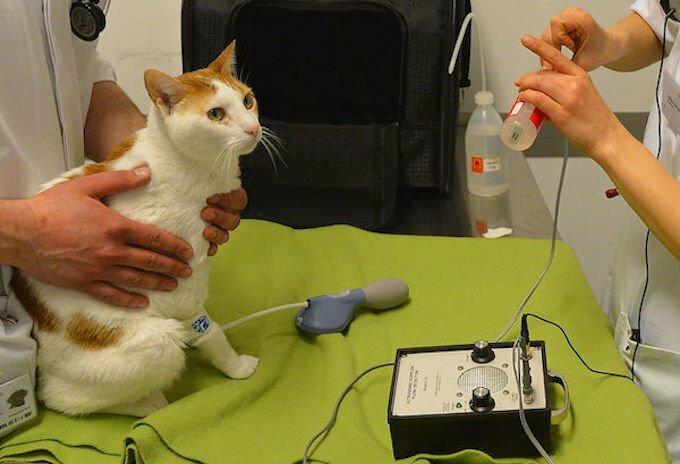 For a start, when you’re sitting in the comfort of your own home, you’re less likely to be pressurized into ordering a never ending series of tests for your cat. (And, much as they do great work, we all know how vets love nothing more than to tell you that your cat should really get that extra blood test, just to be sure of ruling out, you know, feline leprosy or potential kitty OCD.) Also, you’re not going to find the cheap shot of a “waste disposal” entry on your bill when your cat’s being examined at her own home. 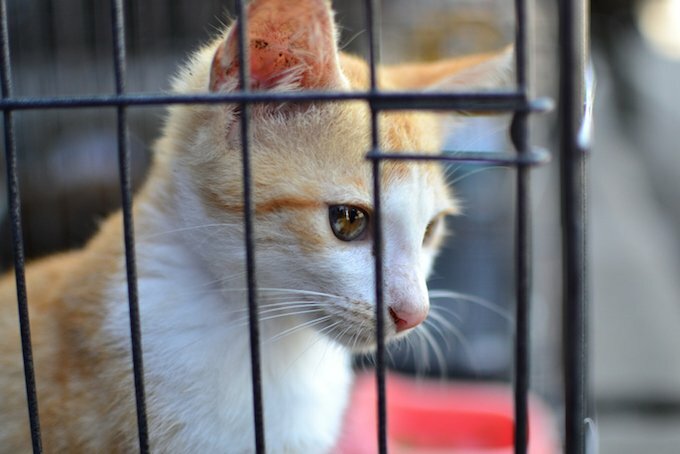 If a course of medicine or a type of supplement is recommended for your cat, the home vet is similarly less likely to be concerned with hawking the product to you at an inflated price. I’ve been in a traditional vets office where I’ve been given the hard sell about lysine — which Mimosa takes for the feline herpes she picked up during her wild stray days — knowing full well that the exact same brand of powder is a third of the price at any pet store. The home visit vet seems to have realized that carting around cases of medicine to up-sell to pet owners will just make them look like a snake oil salesperson. When Mimosa seemed to be congested one fall, I contacted the same home visit vet only to be told she was booked up for a couple of weeks. Wonderfully, the vet then emailed me back some advice about things to try before taking her to another vets. The tips worked (and there was no mention of any sort of a fee). I suspect if I’d had called up another vets, their only advice would have been to bring her in for an examination. Most of the time, the welfare of your cat is as much about keeping her happy and stress free as it is about prescribing courses of medication and exposing her to alien environments. 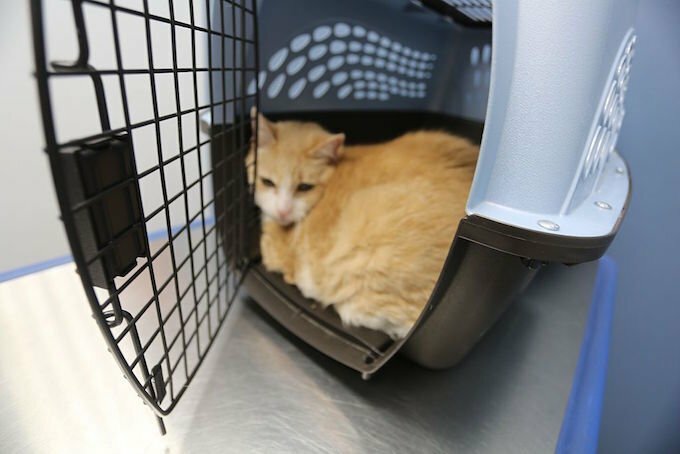 Sure, if you suspect your cat has a serious, deep-rooted illness — or she’s suddenly decided to stop eating — then hurrying her off to a physical veterinarian facility with an emergency department is obviously the responsible thing to do. But for yearly check ups and occasional sniffs and scratches? Do the right thing and get on board with the home vet visit movement.